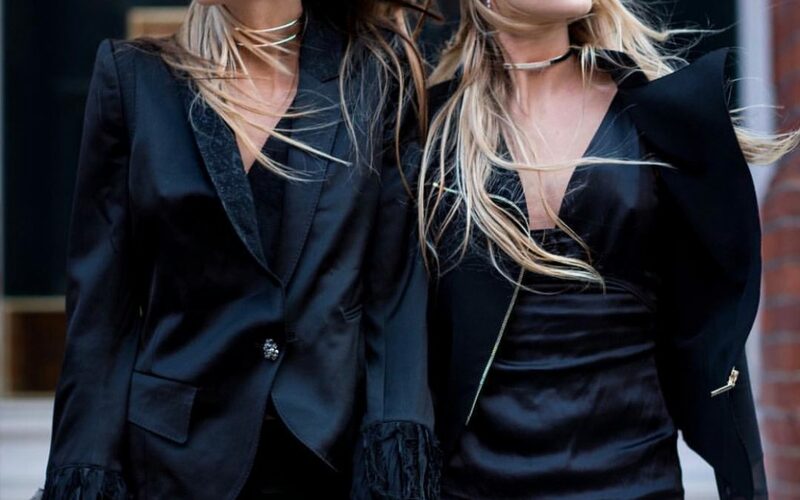 The twinning duo; Lisa and Jessica Kistermann have been working on creating fashion forward concepts since a young age. There is something strangely magnetic about these 1m80 multicultural background beauties. Although coming from a very impressive family heritage, they managed to build an empire of their own. Established in 2012, their brand Crime London has enjoyed immense success. Growing its wholesale distribution into more than 1,000 international stockists (including Luisa Via Roma, Farfetch and Galleries La Fayette) and trending upwards with a sell-through rate of 85% in just a short amount of years that leads them in selling out at more than 120,000 pairs per season. From classic premium leather, to hi-tech waterproof neoprene, to silver metal studs and gems – the sister’s have captured the essence of fine luxurious Italian quality materials while keeping a lower tiered international price (€139 to €259). An accented cosmopolitan feel that can be delivered to your door anywhere in the world. What is your background, and how did you decide to get into this business? We are multicultural and have mixed roots of German, Greek and Jewish. We were born in Florence, Italy and grew up there as well. After attending the American school, we moved to London at the early age of 17 for college. We are Polyglots and speak five different languages . In the last 10 years, we were based in five different countries (London, Moscow, Bali, Singapore, USA) for studies and work. Recently, we slowly started to spend more time in Italy — that even being within our roots, it was still a country for us to yet discover. In university, we studied International Business and Russian at European Business College. We loved London, and our independence. We fell in love with the alternative side of the city and the underground culture. Growing up our father always gave us a rational prospective which made us look into things very pragmatically and was never really attracted by the glitz of the fashion industry. However, us having a strong sense of style, which we definitely got from our mother. She always brought us to play around with clothes, trying to find something new, or to wear things differently from the conventional ‘fashion rules’. We realized there weren’t many premium high-quality sneakers for a reasonable price. Recognizing both a challenge and an opportunity – Crime London was born. A sneaker that would bridge the gap between street-wear and high-end fashion. Describe the aesthetic that represents your brand’s DNA? Our collection consists of a variety of unique and contemporary models. All of our products are handmade with great care in the Island of the Gods, Indonesia; using only the finest Italian materials. Staying true to our roots we also love to travel to get inspired by different cultures and people all over the world. As we bring our passions and inspirations to more and more places, Crime London is designed to become more than a sneaker brand only – blending culture into design. Creativity into spaces. This is what keeps us inspired while developing our collections. Our showroom in Italy, is a large 400sqm loft in Via Marcona 3, located in the centre of Milan set amongst the most renowned fashion showrooms of the city. A clandestine attitude welcomes you by the ever-changing iridescent walls, over-sized black paintings and Crime London customized gadgets (motorbike, surfboard, skateboard, boxing bag, DJ booth, basketball net, lounge bar). A space of soaring high ceilings, enormous windows and an overall feeling of live/work zone. An area with a conductive to different configurations limited only by your wild imagination but imprisoned each season by our new collection. Tell us more about your Ibiza store and the music that influences you? Groove is a rhythm, a sensual pleasure, involvement, a mix of cool & funky. Groove is the sensation experienced when certain music is listened intensely. It’s the capacity to feel the past, it’s like getting the shivers upon experiencing something for the first time – Groove is the sensation of Crime London. We’ve been exposed since our childhood to many different genres of music (classic, jazz, salsa, disco). Being both hyperactive souls we are always on the look-out for an adrenaline rush. Our close friends call us ‘mercury sisters’ which clearly needs no explanation. While exploring East London we connected with many underground artists, such as the DJ Ricardo Villalobos that brought us to a collaboration of a party sneaker named after him. This evolved in choosing the idyllic young and cool island of Ibiza as our fist location of Crime London store in 2014. A location the perfectly reflects the mood of the brand, located in the historical old town, the shop is a new cathedral to the gritty underground vibe of the streets of London transported into the hedonistic international party capital of the world. Fascinated also by interior design, we personally collaborated in the evolution of the project combining state of the art design with metropolis cool. Deconstructed metal melds through full height mirrors to a chromatic ceiling and its kaleidoscope of colors. State of the art design is symbiotically combined with the groovy hippy Ibiza roots which created the most exciting store opening of that season. Ibiza has provided the backdrop for strong seasonal collaboration with the island’s best world renowned world clubs, DJs and brands. Strategic marketing takes place by forging partnerships with selected venues and individuals to introduce Crime London to the myriad of cultural and economic groups that flock to Ibiza through out the summer period. It was definitely controversial at the time as fashion and underground are usually opposites. As trends start in the underground world, are not as cool when they hit the mainstream fashion circuit, loosing its edgy peculiarity. People who buy our sneakers love the versatility – they dress them up or dress them down. Let us know more about the approach of online and e-commerce strategies that Crime London has used? In 2019 technology is a growing tool that plays a key role in consumers choices. The capability to personalize the shopping experience and the convenience of being able to learn more during a new product launch and purchase products from anywhere at any time. Being also an e-commerce brand, we invest a lot in online marketing strategies to obtain new costumers as well as entice old customers to keep coming back to our online store. We have a tech team analyzing all the websites traffic, conversion rate and consumer behavior that is constantly changing and evolving to make our online shopping a user friendly experience. The growth rate in 2018 was +45%. We strongly believe in our platform and these strategies which will lead us to a constant international online growth. How do you two sisters plan to take on Fashion Week 2019? Fashion Week is like being on tour as a musical artist – it’s the same people, like a big family, that move in four different cities within a month: New York, London, Milan, Paris. It’s the fun side of work, where we are all connecting and get inspired by the creations and visions from one another. We exhibit at trade shows in some cities, while in other we present the collection in our showroom with appointments from clients and buyers. You get the chance to connect with so many different people also from different industries which makes it fun and exciting. Name us some celebrities and influencers that wear Crime London? Currently we’ve had Alessandra Ambrosio, Sienna Miller, Jamie Dornan, Poppy Delevigne, Nicky Hilton, Irina Shayk , Jessica Hart, Chris Brown, Lindsay Lohan. It’s inspiring to see our creations on different artists.